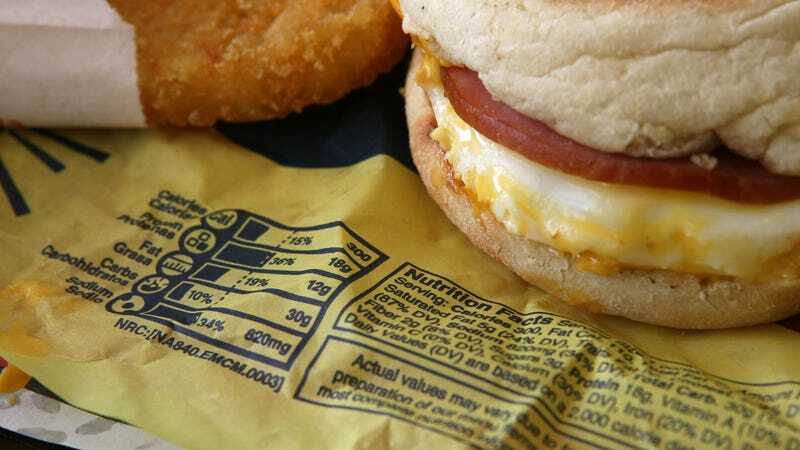 Fast-food wrappers now join an expansive list of Things That Cause Cancer and/or weight gain and/or other calamities: non-stick pans, plastic bottles, coffee, artificial colorings, artificial sweeteners, consuming your body mass in Big Macs, etc. At this rate, scientists make it sound like it’s safer to step into traffic blindfolded than try to feed ourselves. Time reports that chemicals called perfluoroalkyl substances (PFAs), which are used in non-stick pans and fast-food wrappers for their water-repelling qualities, have previously been associated with “hormone disruption, immune dysfunction, high cholesterol and even cancer.” But new research suggests that in addition to their link to those conditions, PFAs might also make it harder to keep weight off after dieting. Researchers published the results of a study in the journal PLOS Medicine; their experiment showed that people, especially women, with higher concentrations of PFAs found it difficult to maintain weight loss, perhaps due to a lower resting metabolic rate. “These data provide initial evidence suggesting that PFASs may interfere with human body weight regulation and counteract efforts to maintain weight loss in adults,” the study’s authors summarize. Well, great. This initial research suggests that before we even bring the Big Mac to our mouth, we’re already regaining weight. We await the next study, which will inform us that merely driving past the Golden Arches is making us fat.